This program contributes to the ceremonial spirit of graduation. Donned in caps and gowns, the candidates assemble to repeat the Veterinarian’s Oath and receive diplomas and AVMA membership certificates. The highlight of the program is the investiture ceremony, when each candidate is hooded with the academic hood, an ancient symbol of scholarly achievement. The platform party consists of deans, department chairmen, university administrators, faculty, and guests. An informal reception follows the program. This annual event is scheduled at the end of the second semester just prior to commencement. It is at this time that veterinary students from all classes are honored for their outstanding academic achievement, leadership and service. In addition to the student awards, selected faculty awards are also presented. Alumni of the CVM are invited to return to campus for continuing education and fellowship. The annual College of Veterinary Medicine Open House is held in the spring of the year. 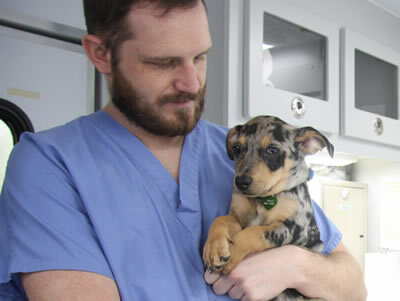 It provides the CVM with the opportunity to showcase our students, the profession of veterinary medicine, and the unique teaching, research, and service activities at our college. The general public is invited to tour the facilities, visit student-designed educational exhibits, and to observe other animal or animal agriculture related exhibits. This annual event is scheduled at the end of instructional period 11. The event recognizes the transition from the didactic pre-clinical curriculum to the clinical, case-based portion of veterinary professional education.